You know what I’m happy about? I’m happy that the lines are gone at the Doughnut Vault. I walked up and grabbed a chestnut and coffee a few Thursdays ago at 9:30am and didn’t have to wait. All those foodie posers are gone on the weekdays. You know who I’m talking about, it’s those people who wait in line for popular, unhealthy comfort food so they can snap a picture and put it on Facebook to appear cooler. What’s the point of that? I have a new twist on that tired meme. I took this picture of a popular, unhealthy comfort food and posted it on Instagram with cross-postings to Facebook and Twitter and made a snarky comment so that it appears I live a life full of danger and excitement… and I threw in a funny hash tag to blow the doors off my unhealthy, comfort food street cred; all because I think it will make me appear cooler. Okay, maybe I am a foodie poser. No! I’m just a man, who grew up with a dad who owned a supermarket, which had a bakery in it, where I often sat with my grandfather eating donuts and drinking cold beverages, at a Formica counter, seated on spinning faux bar stools. That’s who I am. So it shouldn’t surprise anybody that I occasionally deviate from from the path of righteousness and grab a doughnut. It’s in my blood. For all I know it’s a genetic blip that causes me to crave this stuff, probably inherited from my mother, like my early-onset male pattern baldness supposedly was. I’ve had doughnuts on my mind since I saw a snippet from the Reader the other day about Munster Donut (thanks G). 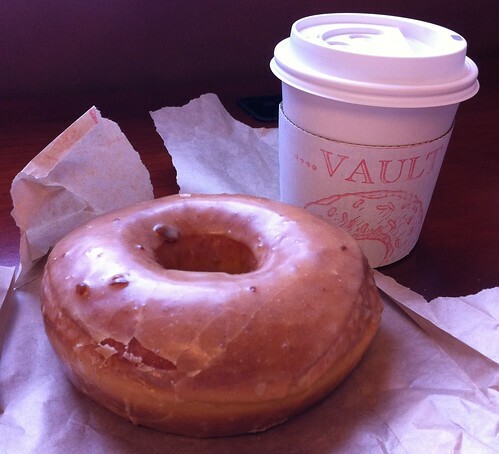 This truck-tire sized nutty, maple, caramel, sugary donut was just the antidote to get Munster Donut off my mind. It’s a massive raised doughnut with a glaze/frosting double whammy. By that I mean you get standard glazing on most of it, plus a subtle double dunk of chestnut frosting. One other item I’d like to expand on – that little cracking in the frosting in the lower right need not raise any red flags. This pastry was fresh, fluffy, and gooey. The cracking, I think, is a function of the overlapping of the frosting styles causing a similar-substance adhesion issue. That’s a good thing! Who doesn’t love overlapping frosting? In moderation, of course. Always in moderation. Aside… not me talking, just me thinking… Munster Donut is not completely off my mind. I have friends in Munster. I want to get down there soon. This idea of a Three Floyds/Munster Donut combo sounds like an epic food adventure that I need to have in the mix in 2012. I wanted a chocolate but they were sold out (that’s how it works folks, they make a batch and when they’re gone, they’re gone). Don’t worry, the chestnut isn’t settling, it’s a stellar fried pastry. Posted in food, tagged doughnuts on 2012/02/05 by John.